Ferment is abroad in football. The possibilities widen; new ideas are accepted and implemented within hours of conception. People are interested now in not just who their favorite players are, but what are these fascinating schemes. With the internet comes accessibility: now your high school runs what your favorite college team is not sophisticated enough to do. The ideas come from everywhere. The innovators are born on disparate staffs and the ideas ebb, flow, and crash together constantly, daily, hourly. Now even the big, famous schools must wade into the waters to hire those comfortable with its movements: Rodriguez to Michigan, Tony Franklin hired by Auburn. This ferment is ideal. A decade ago ideas were stagnant. Football was only for the purists, and if you failed to replicate the Platonic ideals, then you hadn't been schooled properly. Five years later, the beginnings of the ferment - turbulent, muddy, a vigorous undercurrent. Ten years later - today, now - the waters are flooding, spilling onto that once sacred ground. Rich Rodriguez, the Johnny Appleseed of the Spread, has been hired by Michigan. The Pundits talk of the "the Spread," the "Gun Spread," the "Gun Option," the "Airraid," the "Zone Read," and the "Pistol." The coaches talk of these too, but they also talk of the "Gun Jets Sweep," and the "Gun Jets," the "Gun Veer," and the "Gun Triple." The ideas stir. They stir football itself. This reexamination of all that came before - restless, relentless. The search for good ideas, new ideas, ideas never before dreamed of. This - the ferment - is not a fad. It cannot be. It is football itself: there's been a synthesis. The 'Gun and its history. The shotgun itself, the perceived center of all of this "newness," has its roots in the beginning of football, however. Most commentators, of course, seem to deify the "shotgun" itself as an entire offense rather than what it is - a particular way to align your quarterback and perform the center-exchange. Ironically, however, they also take a restricted view of the gun’s presence in football history, presuming it was invented, alternative, in the 60s (Red Hickey), the 70s (Tom Landry), the 80s (pick somebody), the 90s (pick somebody), or the 2000s (whoever they root for, or often Urban Meyer or some passing coach). Regardless, it's somewhat silly. The point of this article is to show that (a) the shotgun itself has ancient roots, and is not some passing fad, (b) and, thus by inference, the ferment and change I spoke of in the introductory paragraphs is not as limited as how you align your Quarterback. Indeed, I imagine that the shotgun's history would surprise many such commentators. The “gun” was in many ways the standard back in the early days of football. Especially consider that the under-center snap was not invented until at least a decade or so after football itself was invented, if not longer. In fact, in the fairly early days, players had to actually short-kick the ball with their heel (don’t ask me!) back as a form of snap. Also, the gun and the pass have been around since 1908-1910 or so, since the forward pass was legalized and encouraged by rule changes due to the “brutal” nature of football at a time when the “single-wing” and almost all offenses involved shotgun type snaps which lead to melees resulting from attempts to advance the ball. To demonstrate the trends, I think there are four good “watershed” type games that either were representative for the time or helped us get where we are today, though there are surely others. In 1913, Notre Dame traveled to West Point to face the heavily favored Army. Final score: 35-13, Notre Dame. Knute Rockne, the famous future coach but then little-known end, caught an array of passes from one Gus Dorais, who that day nearly revolutionized the position. The legend grows larger over time, and the forward pass had been legal for roughly eight years, but that day Dorais completed 14 of 17 passes for 243 yards and three touchdowns. Dorais even completed a pass to Rockne that, at the time, was the longest pass play ever. But more importantly, this game was the coming out party for the forward pass. Although this story might be collateral to the shotgun story – indeed Dorais was already operating out of the “gun” – but few would question that the forward pass still defines football today. Outlined against a blue-gray October sky, the Four Horsemen rode again. In dramatic lore they are known as Famine, Pestilence, Destruction and Death. These are only aliases. Their real names are Stuhldreher, Miller, Crowley and Layden. They formed the crest of the South Bend cyclone before which another fighting Army football team was swept over the precipice at the Polo Grounds yesterday afternoon as 55,000 spectators peered down on the bewildering panorama spread on the green plain below. Notre Dame won 13-7. To our story, this game was not so much a watershed as it was representative of the time: Notre Dame ran an all-shotgun offense known as the “Notre Dame Box.” The “box” was a shotgun formation where the center could snap to any one of four guys, depending how they lined up. So, the most famous galloping backfield of all time played in the Gun, however bizarre it would appear by today’s standards. This should serve as a firm rebuttal to the argument that the shotgun is currently new or (more popularly) was invented only to pass. This is flatly wrong. From the beginning of football, the shotgun was about running the football and faking. Indeed, it was even about power. Just ask the Four Horsemen. 3. Chicago Bears vs. Washington Redskins – The day the shotgun died. In 1940 Bears Coach George Halas unleashed his under center offense on the Redskins on the way to a modest 73-0 victory. 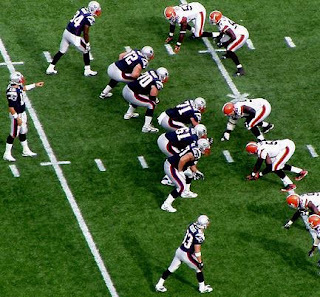 The Bears utilized the then-fairly rare “Tee Formation,” where the Quarterback (remember, he was originally so named because of how far back he aligned - the term was a rugby term before it was a football term) would in line up under center with three backs behind him in a straight “Tee.” Using this formation, along with a series of fakes, counters, traps, bootlegs, and other deception Halas’s Bears crushed the Redskins to win the NFL title. Note that the Redskins had beaten the Bears earlier that season. For the next thirty to forty years, the unequivocal primary method for hiking the ball was the under center snap. This game is also important because it shows that faking, deception, and using multiple ball carriers is not new, nor is it exclusive to the shotgun. It is simply a distinct concept. After this game the shotgun made a few appearances, most famously with Red Hickey with the 49ers and Tom Landry with the Cowboys. And in the 80s and later in the 90s teams as disparate as the Miami Dolphins with Marino, Purdue with Joe Tiller and Drew Brees, and the Hal Mumme Kentucky Wildcats (with the support of Mike Leach) set quite a number of passing records in the gun. But this modern revolution came about, I believe, because people had to see how you could throw and run from the shotgun. Although Rich Rodriguez probably deserve smore credit than anyone for spreading the concepts themselves, it was Northwestern’s late-coach Randy Walker who I think turned the football coaching world on its head one blue-skied afternoon in November, 2000. 4. Northwestern vs. Michigan – The Modern Era Dawns. Northwestern defeats Michigan 54-51. This is shocking enough. Northwestern scored fifty-four points against a Michigan team known for great defense and great defensive talent. Doubly shocking. Quarterback Zak Kustok threw for 322 yards and four touchdowns. Not so shocking from a spread QB in victory. Don’t they always have to throw for this much to win? That’s why they get in the gun, right? But wait, there’s another stat. Northwestern Rushing: 332 Yards; 6.64 average per carry. 332 yards. What? Three-Hundred and Thirty Yards rushing? How did they do that? Yes their running back had a huge day, but the yards that also made everyone sit up and take notice were the 55 yards from Northwestern’s quarterback, Zak Kustok – hardly Vince Young or Pat White in raw athleticism. But the light went off across the country. If Zak Kustok can do it, maybe my guy can too. And even if he’s not Vince Young, just the threat that he can make the defense pay if they over pursue by getting me eight yards, then let’s do it. Obviously, not everyone running the spread now saw this game. Even Gun Guru Urban Meyer didn’t start running this offense until his Bowling Green days sometime after this game, and he admittedly went out to others to learn the offense. The shotgun run-game didn’t bubble up inside anyone like a well-spring. But this was the game that changed the landscape. Where we are are now. So Randy Walker and Rich Rodriguez blew the doors off. The gun is now fully part of the arsenal for nearly every team, and the sky is the limit on what you can do. The all-eleven offense, the pistol, and the single-wing itself are all part of the calculus. Who knows, maybe we’ll see a major team running the Notre Dame box. I thought I’d provide a quick summary of some of the factors in the calculus for when you want to use the gun. Observe that many of the factors come from Coach Homer Smith, so I can’t too much credit. - The QB has to take his eyes off the pass defense and has to watch the ball into his hands. This effect also somewhat reduces the QB’s ability to see the coverage and read changes (Cover 2 to 1, etc.) until after the snap. This is particularly acute for 3-step passes, where you have to catch and throw almost immediately. The read becomes almost exclusively pre-snap. - It becomes a crutch for the QB and an easy way to avoid improving footwork and play faking. I think this is an underrated problem. Footwork in the gun is (a) easier, because it is less, but is (b) prone to getting very, very sloppy. If there is any knock against “spread gun” QBs who go to the Pros, this one of the few viable ones, but can be simply overcome with good coaching. - It retards the notion of a power run game and shifts more towards deception based delays, options, or draw type run plays. This is not a bad thing, though true. - It can amplify your QB’s athletic skills, in either direction. If they are very athletic, it can improve their ability to make plays, but if they are not athletic many traditional QB plays – bootlegs, play action, and certain lead-option type run plays - are almost entirely out of the question. - The footwork of the QB changes as does timing for pass plays. The "mesh" point for hand-offs to the RB change as well. Now Florida offensive coordinator Dan Mullen says this is one reason they run shotgun almost exclusively, so they can practice just one thing and get good at it. So there are pros and cons. What this mostly counsels is a commitment to what you do, an organized, systematic approach to your offense, and an acknowledgment of where your weaknesses are as well as your strengths. The great shotgun teams work on this consistently, the haphazard teams will consistently both live and die by their sword-of-the-moment. While the Run & Shoot is over twenty-years old and I have even discussed its demise from most levels of football, the obvious recent R&S success story has been the Hawaii Warriors under lifelong 'Shooter, June Jones. With Colt Brennan (and seemingly anyone else they put back there), they have lit up opposing teams and broken a few scoreboards along the way. It's a great offense. In the traditional shoot, there were only a few pass packages, but each had multifarious adjustments for each receiver. They did this by requiring each receiver to identify the defense and each would adjust his route on the fly. The QB would synthesize this information and hit the proper man. As June Jones said when he was still in the NFL: "When our receivers run up the field, they are going to look for one of five coverages. A team may use 50 defenses, but to us it will be one of those five." Those five coverages were: "(1) Three Deep Zone; (2) Two Deep Zone, (3) Two Deep Man Under; (4) Man Free [One safety deep with man-to-man underneath]; (5) Four Across Man (Blitz)." Now, this was quite successful for many years. Without overemphasizing the impact, the rise of the zone blitz muddied the waters for many of these reads and hastened the R&S's retreat. I say I don't want to emphasize this too much, because the zone blitz has been around for at least as long as the Shoot, so it wasn't just that. But there has been a definite trend among Shooters to reduce the number of reads that receivers must make. Even Jones has reduced the amount of reading in his offense and appears to have discarded a few of the concepts completely, while only adjusting others. And yet, the "reading" is what makes the Shoot the Shoot. So that is my topic today. I have said many times that regardless of whether you see teams run the "Run and Shoot" per se (and I am talking about the "Run and Shoot" as a distinct system, not just a generic term for any ol' spread team), you will constantly see the R&S concepts and you will continue to see them for a long time. So in this post I want to discuss one of the most common and successful concepts, the Switch. The Switch is one of the Shoot mainstays, but the concept has transcended the offense and now chunks of NFL and College playbooks are dedicated to the "switch" - often from coaches who would otherwise show nothing but disdain for the now supposedly discredited offense. But to many coaches, players, and fans, the play is still shrouded in mystery. In the original R&S, each receiver had the five delineated options depending on what coverage he saw. They could break it quick on slants, run vertical routes, post routes, curls or in cuts. When it worked it was beautiful. But sometimes, to borrow Yeats's phrase, "things fall apart." Or simply it took immense practice time for receivers to get good at running the play. Indeed, it is simpler to teach this kind of thinking when all of your routes adjust. But it's not quite so simple if you run curl-flat as your bread and butter play, with no reading, as many teams do. And yet. the play thrives. Some coaches have installed the switch and simply eliminated the reads entirely. This is a sound approach, and it captures the initial beauty of the play: the "rub" the two switching receivers create against man. And it still works as a kind of "vertical stretch" where the two receivers can put deep defenders in a bind with one down the sideline and another in the seam, especially if a backside receiver runs in the seam as well. But the play's potency is in its variance. And you can be variant without overly complex reads. How? Here is how I suggest running the play, as dithered from the best College, Pro, and High School minds who use this concept. Below is a basic diagram of the route. Inside Receiver: The inside receiver will come under the outside guy on his route, and wheel up the sideline. All he is looking for is whether there is someone deeper than him in the deep one-third of the field. Or, if the guy on him is playing him in man, he just asks: "He's even? I'm leaving! (Running deep) He goin? I'm stayin." It's as simple as deciding whether you could get open deep or not. If the defender stays deep, the receiver will stop at 10-12 yards and settle and curl back to the Quarterback. - Middle of the Field Closed (I.e. Is there a single deep safety in the middle of the field, like in Cover 3?) - Run a seam. - Middle of the Field Open (I.e. Are there two deep safeties with no one deep down the middle?) - Run a square in at 12 yards. I have previously described the nuances of this MOFO/MOFC read. Now, this might sound a bit tricky, but this is the one, core "reading" principle that any receiver can quickly identify both before and after the snap, and in most cases it is quite intuitive: don't run into coverage. Below is the route against a few coverages to show how it would play out. The QB's read is not difficult. It is a pure progression read, though pre-snap and post-snap he will identify 2-high and 1-high so he knows what he's looking for. Against 1-high he will look at the F/S (deep middle safety's) movement. He will peek for the backside seam but read (1) inside switcher, (2) outside switcher, and (3) outlet to running back. One of the purposes of this article was to show that this concept, native to the Run and Shoot, can be run in many offenses. I have shown it so far in a very Shoot friendly formation. But do not be fooled: this route can be run by any two line of scrimmage receivers, in nearly any offense. See the diagram below with the Switch with play-action from the I formation. Again, you can run this from any formation you like. And finally, if one did adopt to their offense (or you begin to notice it on television), there are further adjustments you can make. One of the long-time best has been the "Switch-Smash," shown below. On this route the outside receiver stems inside and then pushes to 12 yards before running a corner route, while the inside receiver "wheels" out and pushes to 5-6 and then hitches back. He then delays briefly, and if the QB does not immediately deliver the ball, he will work to find the opposite spot or burst and lose his man to man defender. This is a great change up, particular against a team that runs Cover 2. As a final parting shot, I will show you a few more variations with what you can do with this play. The concept is simple, so you can build on it or combo it as you like. The shallow crossing routes have become very popular recently. A recurring question is how to use the running back on the play. Send him to the side the shallow is going, or where he came from? For an earlier discussion of the shallow cross, see my article on how Mike Martz uses the shallow cross in various ways here. Martz is a pretty comprehensive guy and this covers most of the bases. Depends what you're doing on the play. The Airraid (Mike Leach/Texas Tech, I think Kansas with Mark Mangino, Troy St., Hal Mumme) guys let him "leak" out to the side the shallow came from. This creates a nice "triangle" for their hunt route coming over the middle and works as a nice hi/lo read. They look at the shallow first. Some other coaches will send a shoot/swing/wheel to the side the shallow is going. Petrino used to do this at Louisville a lot (especially with a no-back protection, shallow came from trips side, single rec side (TE or split end) would run a post or a square-in). The reason is that the RB will pull the flat defender on that side out. That way the shallow will come open in the void he has created. Another good option is to have the RB run an angle route to the side the shallow came from. Mike Martz often does this. Any hesitation by the Mike backer can create a nice void for the RB to get into. The "crease" concept is built around this. Purdue and the Airraid guys will also send the running back on a full swing or shoot to the side the shallow came from. Both will usually have the outside receiver run a curl. (This also relates to the drive or "stem" concept but without the rubs.) The reason for this is that the curl essentially fits into the same void as the "leak" or "short hook" RB just outside the tackle, but obviously he's farther downfield. But it's the same passing window. There they just use the RB to widen the flat defender out. So the point is there is no one right way, just different ways to attack the defense. This gets back to the notion of "concepts." In other words, the "shallow" is not a concept, it is a route to be used within those various concepts. While a pro team may use each of these and more, a high school team may only have room for one. But each affects the defense differently so what you choose to do may depend on what you already do, what defenses you see, and what you can fit in well. The question was: How do you build downfield routes that stretch defenses horizontally (from sideline to sideline)? An example of a short stretch is all curl. There you have 3 "short" receivers (tight end over the middle, backs in the flat) and two curling back receivers (outside guys) who come under the deep shell of the secondary and stretch four underneath defenders with five guys. Sid Gillman invented the play and Bill Walsh ran it for years and years. See this article for further discussion on concepts and horizontal and vertical stretches. Examples of "downfield" routes that still use horizontal stretch concepts are the three-verticals (corners and a post) which is used to "horizontally stretch" two deep safeties. Also the four verticals play is a deep horizontal stretch, where you use four receivers to stretch three (or, more simply, the two inside receivers to stretch the middle safety). I'm not sure it counts as sufficiently "downfield" but other common ones would just be a 10-12 yard out by #1 with a curl or seam by #2. You read this out to in. Often the RB sits over the ball so you get a kind of 1-2-3 horizontal stretch. Note that several of these routes (like the three verticals with the corners and the post in the middle) employ both the horizontal stretch and the vertical stretch. For example on three verticals you stretch the two deep safeties horizontally with the two corners and the post, but you also stretch the cornerbacks/flat defender hi/lo because you send the runningbacks or a TE type player to the flats. A final thought on this question, however. This may seem like a simple question, but it really gets to the heart of how good passing concepts are built. They are built with sound stretches, often layered over each other to put the maximum pressure on the defense. They are finished by making each route good versus man to man, or including a man to man concept. You cannot build pass concepts that beat all potential coverages, but your goal is to make the defense work at stopping you and make them pay for their mistakes. This is from Norm Chow in 2002 (@ NC State when he had Phillip Rivers at QB): You can see that on SOME of these - he mixes 2 or even 3 concepts within 1 pass. To better understand this post check out the BYU plays/numbers here, and compare these routes. He used these same routes at USC and NC State and still does in the NFL. 1. "QUICK GAME CONCEPT" = entire 3 step drop series ("50 SERIES") except for "4 Verticals". 2. "QUICK VERTICALS CONCEPT" = 3 step game with 4 verticals. NOTE: "60 SERIES" = 5 step drop (SOME but very little 7). 4. "HORIZONTAL STRETCH - RUB CONCEPT"
5. "DEEP HORIZONTAL STRETCH CONCEPT"
6. "DEEP HORIZONTAL STRETCH - HI/LO CONCEPT"
7. "VERTICAL STRETCH - HI/LO CONCEPT"
8. "FLOOD - OBLIQUE - HI/LO CONCEPT"
9. "HI/LO - OBLIQUE STRETCH CONCEPT"
A) "HORIZONTAL - TRIANGLE STRETCH CONCEPT"
B) "HI/LO - RUB CONCEPT"
C) "SNEAK - RUB - HI/LO CONCEPT"
THESE (ABOVE) were used on some "TAGS" that aren't in the base passes listed above (WHICH CAN BE FOUND IN JUST ABOUT ANY OF HIS BYU BOOKS). “61 Y OPTION” – 5 step drop. Eye T.E. and throw it to him unless taken away from the outside by S/S (then hit Z), OR inside by ILB (then hit FB). Don’t throw option route vs. man until receiver makes eye contact with you. Vs. zone – can put it in seam. Vs. zone – no hitch step. Vs. man – MAY need hitch step. “62” - MESH – 5 step drop. Take a peek at F/S – if he’s up hit Z on post. Otherwise watch X-Y mesh occur – somebody will pop open – let him have ball. Vs. zone – throw to Fullback. “63” - DOUBLE-IN (split end post, Y-10 yard in, Z-15-18yd dig) – 5 step drop and hitch (7 steps permissible). Read F/S: X = #1; Z = #2; Y OR HB = #3. “64” – SPEED OUTS - 5 step drop. Key best located Safety on 1st step. Vs. 3 deep look at F/S – if he goes weak – go strong (Z = #1 to FB = #2 off S/S); if he goes straight back or strong – go weak (X = #1 to HB = #2 off Will LB). Vs. 5 under man – Y is your only choice. Vs. 5 under zone – X & Z will fade. “65” – Y-SAIL/STRONG FLOOD - 5 step drop and hitch. Read the S/S. Peek at Z #1; Y = #2; FB = #3. As you eyeball #2 & see color (F/S flash to Y) go to post to X. Vs. 2 deep zone go to Z = #1 to Y = #2 off S/S. “66” – ALL-CURL- 5 step drop and hitch. On your first step read Mike LB (MLB or first LB inside Will in 3-4). If Mike goes straight back or strong – go weak (X = #1; HB = #2). If Mike goes weak – go strong (Y = #1; Z = #2; FB = #3). This is an inside-out progression. NOT GOOD vs. 2 deep 5 under. “67” – 3-VERTICAL/DOUBLE CORNERS- 5 step drop and hitch. Read receiver (WR) rather than defender (Corner). Vs. 2 deep go from Y = #1 to Z = #2. Vs. 3 deep read same as “64” pass (Will LB) for X = #1 or HB = #2. Equally good vs Cover 2 regardless if man OR zone under. “68 SMASH” – SMASH - 5 step drop and hitch. Vs. 2 deep look HB = #1; FB = #2 (shoot); Z = #3. Vs. 3 deep – stretch long to short to either side. Vs. man – go to WR’s on “returns”. “69 HB OPTION” – Y-SAIL - 5 step drop - hitch up only if you need to. Eye HB: HB = #1; Y = #2. QB & receiver MUST make eye contact vs. man. Vs. zone – receiver finds seam (takes it a little wider vs. 5 under). Only time you go to Y is if Will LB and Mike LB squeeze HB. If Will comes & F/S moves over on HB – HB is “HOT” and will turn flat quick and run away from F/S. Otherwise HB runs at his man to reinforce his position before making his break. NOTE: BLITZ AUDIBLES IN “60 SERIES” when we want “Y” to enter in protection on widest rusher (S/S or OLB) his side: “MAX PRO”. 2. “63 Stay” – gives X on post if F/S lines up strong on Y. 3. “62 Stay” – gives Z on post if F/S aligns weak on HB. Despite the lofty title, this post focuses on the narrow topic of calling the right play in a football game. Coaches spend an enormous amount of time studying film, determining tendencies, creating gigantic scouting reports for each opponent, and then distributing them to their other coaches and to players who do not read them. Barely sleeping is a badge of honor, particularly at the highest levels, we are sure that more work equals more success. This is surely true, but how is time best spent? And how should the entire idea of "play-calling" be thought of? Despite all the time spent on preparation, when asked most playcallers, such as Notre Dame's Charlie Weis, say that playcalling is "more art than science." If so much of it is gut feeling and chance during the game, then maybe the better strategy is to get some sleep during the week. I'm kidding, as I put a high premium on preparation, but can active playcalling do more harm than good? And what are the boundaries to knowledge and insight into what the other guy is going to do? Is it ever better to pick your call or choice randomly? Don't we already do that quite often? In Edgar Allan Poe's the Purloined Letter, a character recounts a story of a young man who excels at game called "odds and evens," more popularly known as "matching pennies." The game is a two-strategy version of rock-paper-scissors: Each player secretly turns their coin to heads or tails and then both reveal their choices simultaneously; if the pennies match (both heads or both tails) then one player gets a dollar, if they do not match then the other player gets the dollar. As told in the story, the young man quickly sizes up his opponents, gains a psychological advantage, and amasses a fortune by outguessing his opponents. I suppose all playcallers think themselves like the young man, but most are probably more similar to the suckers. But here's the rub: The suckers could nullify the young man's psychological advantage. By choosing randomly. If the suckers put no thought into whether they chose heads or tails, they would do better than if they tried their best to outthink him. They would break even--a fantastic result against the world's greatest matching pennies player--an unnatural genius who, according to the story, would go through lengthy Sherlock Holmsian deductions to determine if his opponent was going to choose heads or tails. This is a breath-taking result. But it is also scary--would I be better off picking my plays entirely randomly? Playcalling, at least oversimplified, is a lot like matching pennies, or--for a more common game--rock-paper-scissors. If I choose rock and you choose scissors, I get a first down. If I choose rock and you choose rock, I maybe gain a couple yards. If I choose rock and you choose paper--whoops, I just got sacked and maybe fumbled too. A lot of football games come down to who has the bigger rocks and scissors (more talent), but tough, highly competitive games really do come down to whether you picked paper vs. his rock or vs. his scissors. But how many supposedly great calls were just luck? Probably a lot. We try to make educated guesses, but there's something to be said for going random. Let me backtrack for a moment. John Wooden, the best basketball coach ever, talked a great deal about focusing on his team. Norm Chow, now offensive coordinator with Tennessee, mentioned how very often he really does not know what the other team is even running right then, and it would be hubris to act like he always knew. When a playcaller says that it is more art than science, he's really just saying that he's out there making (educated) guesses, but guesses nonetheless. Wooden's insight about focusing on his team is that time is best spent byfocusing on what you can control: developing your own talents and self-scouting--to avoid situations where you do become predictible. The message? When you're scouting you're looking for sure things. Times when you know the other team is going to blitz, or is going to run that one screen pass they like or whatnot, and the best thing you can do to win games is make sure that you don't have any of these true "tendencies" that your opponent can act on. The fact that the other team knows you run it 37.4% of the time on 3rd and 4 1/2 on your own 43 is simply not useful information because it doesn't materially narrow their decision-making. If they know you only run it 3.74% of the time, that is material. To carry the metaphor, you help yourself the most by preventing your opponent from ever knowing that if you lose twice in a row, you always shoot rock. You may still lose three in a row, but you've given him no advantage. Again, this is powerful. Even if you are playing the world's greatest playcaller or rock-paper-scissors champion, you can still break even, and then wait for those rare times when you know they are going to blitz, or come out with scissors, and hopefully carry the day. So what's that about the bend-but-don't-break? Imagine: You are playing rock-paper-scissors. Whoever wins gets $1, if you shoot the same no one gets anything, but if rock wins over scissors, the winner get $10. What will this do to the game? Anyone with any sense is going to try to play rock more often than anything else and rarely, if ever, play scissors. If you shoot scissors you can win $1, break even, or lose $10. If you shoot rock you can lose $1, break even, or win $10. This is the theory behind the bend-but-don't-break defense (and to some extent the more wide-open offenses). The idea is that if you play a gambling type defense, you may win more than you lose, but when you guess wrong, you give up a TD or a big play. The bend-but-don't break will concede by giving up many short passes and runs, and hope not to give up the big play. I am not saying this is a superior strategy, and in fact may be a long-run loser, but it's important to understand the theory. The person practicing that defense recognizes that they will probably be wrong more than they are right, but they think it will be worth it in the long-run--the risk is acceptable to them. This "mixed strategy" thinking is not meant to supplant gameplanning. (Offensive Coordinator: "Sorry Coach, I'm not doing any work this week, Chris's website told me to just go out there and 'wing it.'" Head Coach: "You're fired.") Indeed, much of gameplanning should fit into your estimates of what will and won't be successful, and then you can engage in a bit of the decision to run or pass I detailed in this post. What it does is it gives you a place to start. You should have a general equilibrium strategy based on your talent and what you emphasize going in week to week. You can hope to be a 50/50 run/pass on 1st and 10 team, with focuses on quick and intermediate passes and power runs. This is your so-called "identity" and your practices will focus there because it is what you do the most. Then you "kink-it," or skew your weekly plan to the things the defense is weakest against. Who do we run against? What coverages will we see the most? Do they blitz a lot? Another important application is the "intelligent" mixed-strategy. For example, you face a team that runs the gamut of coverages: Cover 1, 2, 3 and 4 and man and zone and every kind of blitz and they also drop 8 guys into coverage sometimes. But you notice that if you line up in a "trips formation" they will only play Cover 1 or 3, then you have significantly improved your chances. You still don't know for sure if they will be in Cover 3 or 1, or if they will or won't blitz, but you r mixed strategy has been narrowed to a better range of possibilities. Yet, most teams know their own weaknesses. Most defenses match their weakest defenders with their strongest, not content to let half their defense get run over every week. Further, you get into that neverending mental game: I want to throw quick routes because he likes to blitz. But he knows I know he likes to blitz, so maybe I will throw off deeper drops because his defenders will be looking for my quick passes. But then maybe he knows that I know that he knows that I know he likes to blitz, and thus will blitz anyway countering my counter. And so on. Do I have any special proficiency for this? What if the defensive coordinator is straight out of the Purloined Letter? Remember Norm Chow: if you are so certain of what the other team will do or you have a true read on the opposing coach, it's probably just you being arrogant. Imagine you are a wing-T youth coach, and you have only three plays: the dive, the bucksweep, and the waggle (bootleg). You can win a lot of games simply by selecting those three plays practically at random; each perfectly counters the other. Then, every so often, you'll see that moment when you know that the waggle will be there. The corners are coming up for the run, the receiver has a mismatch, you know the QB will break contain, so you call it--TD. Simplified, this is where gameplanning, play-calling, and deception all intersect. Although I've focused on play-calling from the sidelines, I recognize that in modern football playcalling differs from rock-paper-scissors in that it is not a static, simultaneous "now show it" game. In football you call the play, then show a formation--thus narrowing the range of possibilities--then the play begins, and with good recognition both the offense and defense can react to what the defense is doing and put themselves in position to win. Many very good offenses try to "cheat" on good playcalling by calling everything from the line of scrimmage, and the run and shoot and the triple option try to "cheat" even further by putting a premium on "reading the defense" to make themselves right all the time. Many good defenses operate on similar principles. The important thing to remember for now is that deception and duplicity are your best weapons to prevent this kind of targeting, and once you've done that, you tilt the advantage back in your favor, and the "mixed strategy" reemerges as your best course. And again, if you can limit their strategies by formation or design, then you can improve your mixed strategy by being able to choose the things that defeat their known range of possibilities, rather than than having to be totally random.